I have been playing around on the ipad making fonts! This was my first one, so it will be free! I hope you like it! 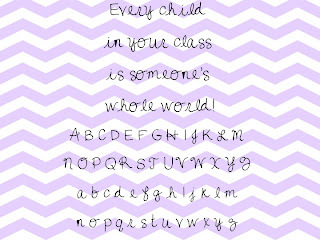 Click on the picture to download it for free from my TPT site! I wanted to answer your questions but your settings dont let me reply to you via email. I am still using the same program for most clipart. I use the paint bucket to color things in but then I zoom in and use the pencil to touch things up. About the stylus, try playing with the pencil settings Toni the app to get a finer point and zoom in for detail work. Feel free to email me at surfingtosuccess@yahoo.com if you have more questions. I'm happy to help.